Apron Size (L*W): About 28 x 21 cm/11" x 8.27"
Shoulder Strap Width: About 8 cm/3.15"
1.Gives you safer and easier grass trimming. 2.Safety and comfort are the key to the grass trimmer shoulder strap. 3.Waist band can be adjusted to suit with a simple easy to use buckle. 4.The strap won't dig into your shoulder, because it has an impact softening shoulder pad. 5.Takes the strain away from your hands and wrists, and distributes the load evenly across your shoulder. 6.This is a universal double shoulder harness to suit many makes and models trimmers, strimmers and brush cutters, like for STIHL , Husqvarna, ECHO. 7.It is designed to fit nearly all makes of electric and petrol trimmers, however big or heavy they are. Once the strap has been attached to the trimmer it remains firmly in place, until you decide to release it. Due to manual measuring, please allow 1 ~ 2 cm error, thank you. *Safety and comfort are the key to the grass trimmer shoulder strap. *The strap won't dig into your shoulder, because it has an impact softening shoulder pad. *Takes the strain away from your hands and wrists, and distributes the load evenly across your shoulder. 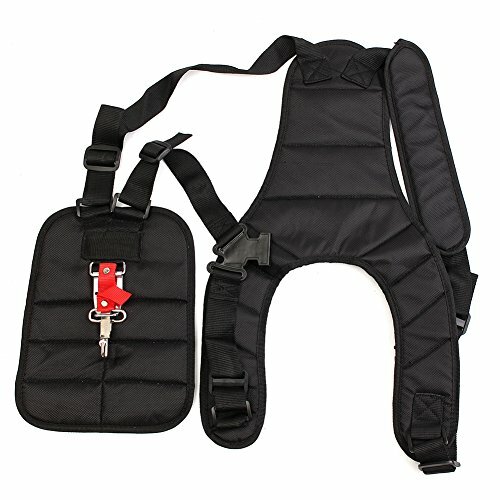 *This is a universal double shoulder harness to suit many makes and models trimmers, strimmers and brush cutters，like for STIHL , Husqvarna , ECHO. If you have any questions about this product by Fovolat, contact us by completing and submitting the form below. If you are looking for a specif part number, please include it with your message.